Complete the exercises in sequence. Take a one-minute rest after each exercise, before moving on to the next. A stationary balance on one leg will activate the stabilising muscles in your body; master this before starting to destabilise yourself. Think you’re too old or not fit enough to start running? Or perhaps think you’re the wrong body shape? 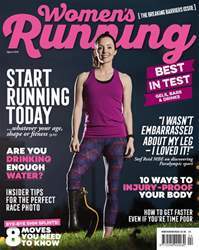 The April issue of Women’s Running, on sale 22 February, will make you think again. Find out why running is so accessible, despite these preconceived barriers, and use our ultimate beginners’ training plan to get you started. Get inspired by our cover star, Paralympic athlete Stef Reid MBE, who despite losing her leg in a near-fatal boating accident, went on to become the reigning World Champion in long jump. You’ll also hear from three women who refused to let their disability, weight or cultural barriers stop them from running. Worried about injury setting you back? Don’t miss our 10 top tips for injury prevention, or our lower-leg workout, designed to combat shin splits, plantar fasciitis, calf niggles and more. With marathon season looming, we’ve also got essential advice for you on staying hydrated – as well as reviews of the latest gels, bars and drinks – to help you perform at your best, in training and on race day. You’ll also find our usual kit reviews, expert training advice and inspiring runner interviews. DON’T LET ANYTHING STOP YOU RUNNING! HELP! MY RACE PHOTOS LOOK AWFUL! A GREAT RUN JUST GOT BETTER!